Really? If not, maybe you should. I have something to tell you: I read this book on the Kindle. Before we left on our trip, I asked some of my closest friends to recommend some titles that would be decent for a Kindle. (Meaning that it had be exciting enough to keep me awake on an airplane and not exciting enough for me to wish that I had purchased an actual hard copy of the book.) 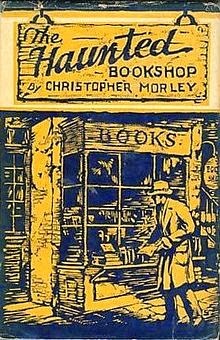 One friend recommended The Haunted Bookshop , by Christopher Morley. I trust this friend's reading judgement and the fact that it's only $0.99 on the Kindle didn't hurt her argument either. This was the title I was most eager to read on the trip and with excitement for the book (and the trip we were on) I turned on the screen and began to read. The Haunted Bookshop started off brilliantly. It was written in 1919 and deals with the tensions which existed in post-World War I. The main character is the owner of The Haunted Bookstore. This special bookstore is not haunted in the ghostly sense but haunted with literature and the words from dead authors. The bookstore owner, Roger Mifflin, loves his work, delighting in selling people "what they want, even if they don't know that they want it." Mifflin's position on the world in general is that "malnutrition of the reading faculty is a serious thing." I so agree. He lives, breathes and devours books and desires to share the love of reading with every other individual on the face of the earth. How could you not like such a character? "Let the bookseller learn to know and revere good books, he will teach the customer." "Far from it. Living in a bookshop is like living in a warehouse full of explosives. Those shelves are ranked with the most furious combustibles int he world -- the brains of men. I can spend a rainy afternoon reading, and my mind works itself up to such a passion and anxiety over mortal problems as almost unmans me. It is terribly nerve-racking. Surround a man with Carlyle, Emerson, Thoreau, Chesterton, Shaw, Nietzsche, and George Ade - - would you wonder at his getting excited? What would happen to a cat if she had to live in a room tapestried with catnip? She would go crazy!" "My business, you see, is different from most. I only deal in second-hand books; I only buy books that I consider have some honest reason for existence. In so far as human judgement can discern, I try to keep trash out of my shelves. A doctor doesn't traffic in quack remedies. I don't traffic in bogus books." One of my wildest dreams in life is to own a used bookstore. In this book store I will sell only the books that I find worthy of mass public consumption. I would sell people what they didn't know that they needed. In my dream world, I am Roger Mifflin and therefore I really connected to the book straightaway. Alas, The Haunted Bookshop is not just about booksellers and a deep love of reading. It is also about a mystery and some romance. In all honestly, after chapter two I grow a bit hazy on the story mostly because I did not understand Morley's writing style. If he was speaking on a topic of great interest to me (i.e., the love of recommending great books) then I was all ears. I had a hard time tracking with Morley largely because I could not place his writing. The story is set in Brooklyn and there are hints of New York woven through the screen of pages. However, Morley writes as if he really wishes that he was born in Great Britain and gave his story that setting. His characters speak more as Englishmen than Americans and that was quite confusing to me. I spent so long trying to figure out where the story was set that I was missing the plot. "It is to be feared that Aubrey would have badly flunked any quizzing on the chapters of Somebody's Luggage which the book seller had read aloud . . . He was not thinking; he was being thought. Down the accustomed channels of his intellect he felt his mind ebbing with the irresistible movement of tides drawn by the blandishing moon. And across these shimmering estuaries of impulse his will, a lost and naked athlete, was painfully attempting to swim, but making much leeway and already almost resigned to being carried out to sea." I'm glad Morley wrote that out of his system. I hope he didn't speak that way in real life. To conclude, I read this book on the Kindle and I was glad that I had not purchased an actual hard copy (even though I could have done so for only $4.95). I can't necessarily recommend the entire book to you, but if you love books as I do then the first couple of chapters are great reading just for the quotes. There you have my first exciting Kindle reading experience. Ta da! Here is a brief Wikipedia description of the story if your curiosity has been sufficiently piqued. Ah, Carrie. Congratulations on having read your first KINDLE book. I used my Kindle quite a bit when I was commuting, since mine has a text to speech function that I could have read aloud to me while I was driving but that I could still read to myself when I wasn't driving. Now that I'm not commuting, hard copies have taken over my repertoire again. Yes! Never 100% even after flipping through every "page" of minutia! Grrr! When an author uses such superfluous hyperbole I feel like they used a thesaurus and chose the longest, least used synonym! This sounds like a book I need to read. One that I should borrow from the library. ;) Have you read The Good Novel? That one had some great quotes as well! 99% would drive me insane! I' smiling. :-) Though I still prefer paper or hardback books (I struggle not to say "real" books), I do like the Kindle app for traveling and for getting books free or very inexpensively. Though it's a little harder to skim back and forth when you want to reread a section or check out a detail, I do like that I can click and see all the quotes I highlighted - handy for reviews or for reminding me of the parts that stood out. I did buy the Kindle version of this just now as it is still just 99 cents. Sounds like an interesting story even with the superfluous passages.